It has become a very well known strategy that the Syrian Arab Army follows since the beginning of events to hunt the heads of Al Qaeda FSA terrorists groups in order to give options for the followers of such groups to give up their weapons and benefit from the 5 previous presidential amnesties and the continuous latest one for those who have not killed Syrians yet. Hundreds have benefited already from the amnesties of the misguided followers of such groups, many were forced to join under threats by Al Qaeda against them and their families, however, others ‘vow to revenge’ the killing of their ‘leaders’ which leaves the Syrian Arab Army with not many choices to deal with them. 1. Basheer Abdul Aziz Qattan, 34 y/o from Hama killed in confrontation in Aleppo city, he used to be a mathematics teacher in Kuwait misguided by the cancerous growing Wahhabi movement there and sent to fight his own people in Syria, he left a wife and 2 children of 12 years old & 6 months behind chasing the 72 male virgins in hell. He didn’t miscalculated this time. 2. 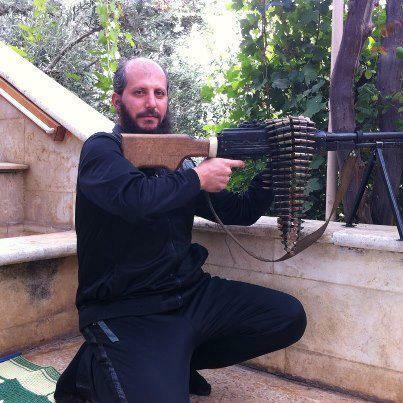 Ammar Ghalban nick named Abu Ghazal (father of deer), from Hama city and a head in the ‘Bashaer Brigade’ of ‘Omar Mukhtar Battalion’, Al Qaeda FSA group, he was killed on the Hama – Homs highway along with at least 10 of his friends. 3. Mustapha Najjar, 27 y/o from Al Ghab valley, Hama, an AWOL soldier turned an officer in the Al Qaeda FSA group killed in Amirieh, Aleppo. The Syrian Arab Army in order to minimize the losses of the misguided and among the civilians is taking heavy losses as it’s not using the US Obama’s drone tactics, rather face to face confrontations.